Is the market town of Masham, with its famous Black Sheep & Theakstons breweries, delicious beer sausages, restaurants, glass-blowing workshop, sweet shop, and autumn sheep and steam fairs. There is also Ripon, the oldest city in Britain; home to a busy racecourse and a cathedral, three rivers and a canal, a Thursday market, a swimming pool and a pretty park, and a hornblower who blows his horn every night from the four corners of the city square. Just outside of Ripon are countless places to visit - such as Lightwater Valley theme park, Newby Hall (a fine Adam house and gardens, still a family home); Fountains Abbey, with its deer park and Studley Royal; and the natural formations of Brimham Rocks, Stump Cross Caverns and How Stean Gorge, not far away at Pateley Bridge. Are the cities of Durham with its university and cathedral; York, with its Roman and Viking history; Newcastle; and Leeds, with its Corn Exchange, Victoria Quarter, Royal Armouries museum, art gallery and Playhouse. Between Harrogate and Leeds visit Harewood House, still a privately-owned stately home. Head south-west to Skipton, ancient market town with canal and castle. 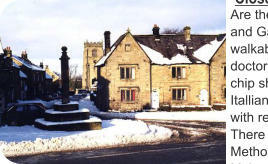 Or, if your pursuits are more rural, head for Ampleforth and spectacular Sutton Bank and the White Horse; or the other way, to Wensleydale and Hawes, to Middleham - former home of Richard III and now a major horse-racing town; or to gorgeous Kettlewell, home of the summer scarecrow contest; or to Aysgarth Falls... well, we could go on. Are the villages of Kirkby Malzeard and Galphay. Both villages easily walkable. Kirkby has a newsagent, doctor's surgery, butchers, an excellent chip shop with Pizzza, Greek and Italian food, garage, a public house with a restaurant in the Queen's Head. There are both Anglican and Methodist churches in Kirkby Malzeard. Footpaths lead directly off the farm, and there are plenty of lovely walks, including bridle paths and green lanes. We provide a map of the farm and indicate footpaths for you. Grantley Arms at Grantley or Galphay Inn at Galphay are good places to eat. South is the charming Victorian spa town of Harrogate, with its wide green Stray, Betty's tea-shop, theatre and cinema, antiques quarter, Valley Gardens, and modern shops and cafes. Close to Harrogate is Knaresborough, perched on a hill above the river, where you can take a boat out under the viaduct. 30 minutes north, on the other hand, will take you to Thirsk - James Herriot's hometown with its racecourse, or the county market town of Northallerton. Or take a gentle drive through the nearby Dales, taking in the dozens of pretty villages with beautiful walks, country pubs and tea-rooms. Are the villages of Kirkby Malzeard and Galphay. Both villages easily walkable. Kirkby has a newsagent, doctor's surgery, butchers, Excellent chip shop with Pizza, Greek and Itallian food , garage, a public house with restaurant in the Queen's Head. There are both Anglican and Methodist churches in Kirkby Malzeard. Footpaths lead directly off the farm, and there are plenty of lovely walks, including bridle paths and green lanes. We provide a map of the farm and indicate footpaths for you. Grantley Arms at Grantley or Galphay Inn at Galpay are good places to eat.